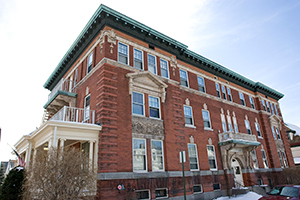 “Cedar Street House is a three-story, newly renovated, and historic building at Fitchburg State, which is home to approximately 28 underclass students. These residents enjoy single bedrooms and a bathroom on each floor, as well as a common living room, dining room, pool table room, laundry room, and full kitchen.” (Office of Housing and Residential Services’ FItchburg State.edu). When it comes to student housing, it is hard to compete with the Cedar Street House. All of this seems like a college student’s dream apartment, so needless to say, it is hard to get in. Only 28 students live there at a time, 14 male and 14 female, and the applicants are selected based on their credits. The Cedar Street House wasn’t always like this though. Cedar Street House has been a part of Fitchburg State University for only 10 years but it has a rich history within the City of Fitchburg. Katrina Brown, from the Fitchburg Historical Society said, “Cedar Street House was called ‘The Home for Old Ladies’”. It was originally located on Beacon Street in Fitchburg, then it was moved to its current location at 130 Cedar Street in 1900. She also explained, “It was built in the 1900’s by the architect Henry Francis, who is known for multiple buildings located throughout Fitchburg”. Cedar Street House served elderly residents of Fitchburg and was a meeting spot for the Women’s Union. open to men the name of the building changed from the “Home for Old Ladies” to “Cedar Street Retirement Home”. Similarly when Cedar House was first established as housing, it was an all female residence hall. Although two years ago it became coed housing. The documents in the historical archive ended in 1994 and so we believe the Cedar Street Retirement Home was shut down after that year. Shane Franzen, the Associate Director of Student Development said, “About 10 years ago we started leasing Cedar Street House, for the first two years we leased it and then after that two years it became university property”. “The building still has a lot of its original features, including the coal furnace in the basement, the blue and white hand carved woodwork in the Great Room. This hand carved colored wall painting is signature of the Architect H.M. Francis”, said Franzen. There was also a dumb waiter which went from the basement to the first floor. Five years ago the University renovated and restored the building to what it looks like today. Which, if you wish you can see here. It’s a beautiful property and a great piece of history to the town and university alike.